Climate change is significant and an emerging threat to public health. Such an impact would translate into two major illnesses: diarrhea and malaria that are highly sensitive to changing temperatures and precipitations which cause two million diarrheal deaths annually, mostly in young children  and more than a million childhood deaths annually by malaria. In India an estimated 0.6-0.7 million children under five die from diarrhea every year. A household survey conducted in India in 1994 showed that the morbidity rate in terms of diarrhea episodes per child per year in the under five population is about 1.7. Another study carried out in four slum areas of Delhi in 1984 showed that out of 3645 children surveyed 26.4% suffered from one or more new episodes of diarrhea in the 2 weeks preceding the survey. In the case of malaria, The World Bank estimates that about 577,000 disability-adjusted life years were lost due to malaria in India in 1998. In order to reduce the negative health impacts of climate change, various programs or measures, known in the climate literature as adaptation measures, are being put in place or are being planned. However, limited work has been done to estimate the costs of adapting to these additional health burdens in India. This study provides an initial estimate of the cost of intervention to cope with the health impacts of climate change in 2030 on diarrhea and malaria for India. There have not been many studies in this direction, and hence this study tries to fill the gap. The estimates are for the costs of climate change only and do not take into consideration population growth and socio-economic development which are assumed to be constant. Data from "Monthly Health Condition Reports from Directorate of Health Services of States/UTs" for Diarrhea and Malaria and from "National Family Health Survey" for Malnutrition. Data on the cost of interventions for diarrheal disease and malaria taken from "Report of the National Commission on Macroeconomics and Health - 2005". The approach used is to (1) assume that the current annual number of cases of diarrheal diseases and malaria would remain constant in 2030; (2) multiply the number of current cases by the relative risks for climate change estimated by the GBD study (under three different emission scenarios, as described in Appendix 1) to estimate the number of additional cases of these diseases that could be attributed to climate change in 2030; and (3) multiply the number of additional cases by the current costs of treatment per case to estimate the additional costs of treating climate change-related cases of diarrheal diseases and malaria. 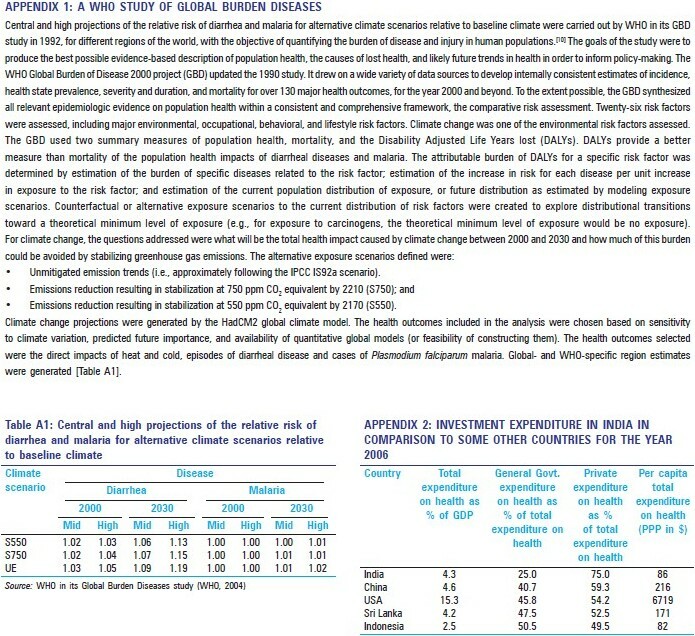 As India constitutes 60% of the Asian population, we do not presume there will be any significant departure of the risk factors related to climate change, from that of the Sear-D region as estimated by WHO in its GBD study. Therefore, it is assumed that projections of the relative risks of diarrhea and malaria will be the same for India also and hence the same is taken for this study [Table 1]. The Mitigation scenario results in fewer cases and lower investment needs than the BAU scenario [Table 2]. The total costs for these two diseases in 2030 under S550 are estimated to be between Rs. 3104 lakhs and Rs. 6752 lakhs; the total costs under S750 are between Rs. 3648 lakhs and Rs. 7787 lakhs; and the total costs under UE are between Rs. 4684 lakhs and Rs. 11,688 lakhs [Table 3]. For the middle scenario, the annual needs are about Rs. 1036 lakhs per year, lower from Rs. 4684 lakhs down to Rs. 3648 lakhs. Should the high scenario occur, the annual investment needs are about Rs. 3901 lakhs lower from the BAU scenario to the Mitigation scenario. The estimated percentage climate change impact in 2030 at 750 ppm is higher for diarrhea than in the case of malaria [Table 4]. Assuming the total cost per case remains unchanged, the total investment needs for combating diarrheal disease would be around Rs. 55,354 lakhs and malaria would be around Rs. 2704 lakhs in 2030. The study provides an initial estimate of the cost of intervention to cope with the health impacts of climate change in 2030 on diarrhea and malaria for India. This adds to the existing literature, which to date mainly included the impact of climate change. Besides it also suggests the urgent need for enhancement of investment now in the health sector by the public authorities which is already inadequate, so as to address the climate sensitive health outcomes at reduced cost in future (Appendix 2). Any further increase in the number of cases of diarrhea and malaria due to climate change as projected in this study may cripple the already inadequate public health infrastructure in the country. Hence, there is an urgent need to respond to the situation by resorting to adaptation and mitigation measures for which there is a requirement of alteration of financial and policy arrangements of the government in an era when the need to address other diseases such as HIV/AIDS, tuberculosis, and other diseases is equally important as that of climate-sensitive diseases. The study at the same time is having certain limitations. Firstly among myriad of other health outcomes we have taken only two of the health outcomes of concern with climate change because of the problem encountered from limited and quantifiable data. Further because of the uncertainties in the estimated costs, on account of limited data due to inadequate studies in the Indian context, they should be taken only as indicators of the size of the financial needs and not as accurate predictions. The estimates are likely to include both under- and over-estimates of the actual costs. Emerging technologies, along with significant investments in research and development, are likely to reduce current health burdens over the next 30 years. In addition the analysis makes a number of necessary, but unlikely assumptions, including that the number of annual cases of diarrheal disease and malaria and the cost of treatment would remain constant. Additional research could reduce some of the uncertainties in the analysis. Additional research also is needed to better project how population growth, socioeconomic development, and other factors would likely influence future rates of climate-sensitive health determinants and outcomes. With all its limitations, the study tries to fill the lacuna in the above area. It proves that adaptation and mitigation can reduce sensitivity to climate change. The case for making public expenditures is strong on economic and moral grounds because the costs without interventions are much higher if we consider the relative risks of these diseases due to climate change. Further, the study recommends that appropriate modifications should be made in the current programs to better address these health outcomes due to climate change to increase future adaptive capacity and to reduce the cost of such interventions in future. 1. Majra JP, Gur A. Climate Change and health: Why should India be concerned? Indian J Occup Environ Med 2009;13:11-6. 2. Kosek M, Bern C, Guerrent RL. The global burden of diarrheal disease, as estimated from studies published between 1992 and 2000. Bull World Health Organ 2003;81:197-204. 3. WHO: Climate change and Human Health: Risks and Responses. Summary. Geneva: WHO; 2003. 4. Jain SK, Khan JA. Epidemiological Study of Acute Diarrheal Disease and Acute Respiratory Infection amongst Under-five Children in Alwar district (Rajasthan), India. Indian Journal for the Practising Doctor, Vol. 3, No. 5, 2006;11: 2006-12. 5. Enzley S, Barros F. A Global Review of Diarrheal Disease Control. UNICEF staff working papers: Evaluation, Policy and Planning series, Number EVL-97-002: UNICEF New York, N.Y., USA, 1997. 6. Hygiene Promotion: IRC International Water and Sanitation Centre. Available from: http://www.irc.nl/home/hygi/hygihome.html. [Last accessed on 2010 Oct 5]. 7. Patil RR, Deepa TM. Climate change: The challenges for public health preparedness and response: An Indian case study. Indian J Occup Environ Med 2007;11:113-5. 8. Markandya A, Chiabai A. Valuing climate change impacts on Human Health: Empirical Evidence from the Literature. Available from: http://www.ncbi.nlm.nih.gov/pmc/articles/PMC2672348/. [Last accessed on 2010 Oct 5]. 9. McMichael AJ, Campbell-Lendrum D, Kovats S, Edwards S, Wilkinson P, Wilson T, et al. Global climate change. In: Ezzati M, Lopez A, Rodgers A, Murray C, editors. Comparative quantification of health risks: Global and regional burden of disease due to selected major risk factors. Geneva: World Health Organization; 2004. p. 1543-649. 10. Murray C.J.L, Lopez A.D. (1996). Global Health Statistics Harvard School of Public Health Cambridge.